I always look forward to apple season. It gives me a chance to continue testing the many apple recipes in “The Art of Fine Baking.” The sweet smell of crisp juicy apples baked in any kind of buttery vessel is hard to resist. With previous posts on unconventional apple desserts like Apple Cheese Cake Puff, Bavarian Apple Pancake, Sauteed Apple Cake, and Apple Roll, I figured it was time to introduce a classic. 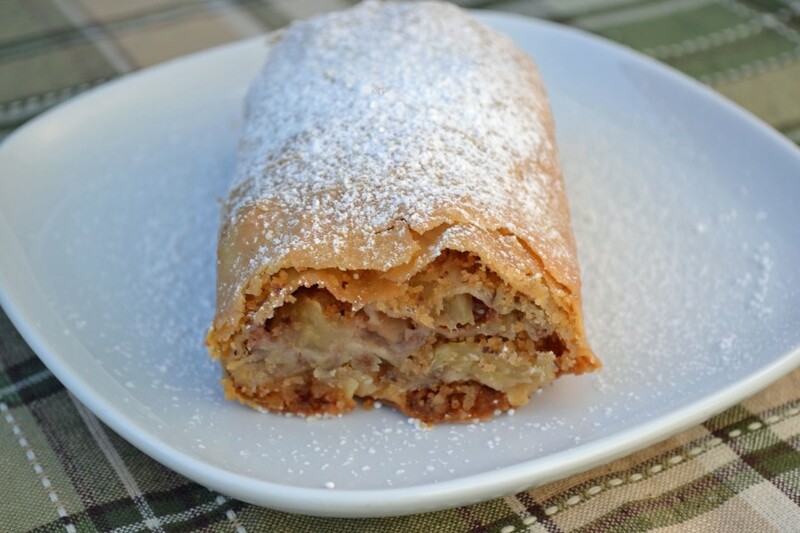 Old fashioned Apple Strudel is fairly well-known but somewhat out of style and awaiting a comeback. Frequently confused with Streusal – the crumbly topping – Strudel is often said to have originated in Austria. It can be savory or sweet and is differentiated from other pocket style pastries by the characteristic paper-like pastry layers rolled around its filling. Apple is one of the most common strudel fillings and this version pulls out all the stops with cinnamon sugar, raisins, and ground walnuts. Much like Puff Pastry and Danish Pastry (which I have yet to tackle), Strudel has always been a bit daunting for me. The idea of attempting to stretch the dough without destroying it seemed frustrating. I’m happy to report that it is much easier than I anticipated. Based on the introduction provided in her book and the number of strudel filling recipes, it appears my grandmother spent a fair amount of time perfecting it (along with James Beard). Her thoughts and instructions are some of the best I’ve found, including on the internet, so I’ve provided them in the basic Strudel dough recipe. Brush strudel dough generously with melted butter. Sprinkle all over with sauteed bread crumbs and ground walnuts. Place a 2-inch strip of sliced apples along one end of dough. Brush apples with butter and sprinkle with raisins, lemon zest, and cinnamon sugar. Fold in flaps of dough at sides of filling. Brush them with butter. Lift up end of cloth nearest filling and make the dough fold over apples. By raising cloth, continue to roll up apple filling until it is completely enclosed in the sheet of dough. Roll loosely. Brush remaining dough all over with melted butter.